The Reverend Linda Faith Chalk was born in New Westminster, British Columbia and moved to Toronto to study in 1976. Prior to this she worked at the Vancouver Grace Hospital as a Medical Clerk for 5 years. After completing two years at the William and Catherine Booth Memorial Training College for Officers she served as an Officer with the Salvation Army in Kamsack, Saskatchewan, Brussels, Belgium and in various postings in Montreal, Quebec. In the process of getting her education in line to teach at the Army’s College for Officers she felt called into the Anglican Church of Canada. Exploring the possibility of ordination within the Anglican Church of Canada God confirmed that calling. She completed her theological education at McGill University earning a Bachelor of Theology with Distinction in 1993, and a Master of Divinity from the Montreal Diocesan College in 1995. She was ordained Deacon on the Feast of St. Andrew in 1995. She served as Assistant Curate at St. Barnabas, St. Lambert until August 1998. 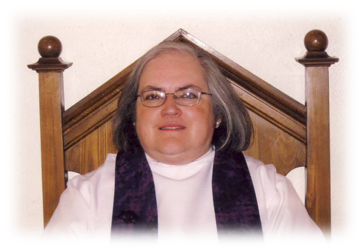 In May 1996 Linda Faith was ordained priest. From 1998 to 2002 she served as the Parish Priest in the Parish of Hemmingford – Clarenceville. In October 2002 she was inducted as the Incumbent at St. Paul’s Greenfield Park. Over the years Linda Faith has studied at the Toronto Airport Christian Fellowship where she attended the Leadership and Father Heart schools to more effectively minister in the gifts of the Holy Spirit. She has also received training with Anglican Renewal Ministries. Linda Faith is an associate of the Isaiah 40 foundation and has attended many of their Healing of the Whole Person seminars and other courses. She regularly celebrates the Eucharist at their 7:00 a.m. Tuesday service several times a month. She did further studies at McGill University in theology and also at CCEF out of Westminster Theological Seminary in Pittsburgh in pastoral counselling. She completed her grade X equivalency in pianoforte with the Toronto Conservatory of Music and was church organist in several congregations, she continues to use her music in praise and thanksgiving to God. A lifelong believer in the effectiveness of Christian camping in the life of a child she serves as the President of Crosstalk Ministries and also was a member of the first team to minister to first nations in northern Saskatchewan. While never having married she is the proud Aunt to two nephews and one niece - Norman, David and Catherine. She has one sibling, Cyril and they are not only siblings but friends and fellow theologians. She is proud to have had a Jewish grandmother, and the richness of these roots have given her a deep love for the Old Testament. Having taught in a French seminary for several years she loves teaching and ministry and is always open to new possibilities. Linda Faith enjoys cross stitch and mysteries and is an avid reader and looking for BBC selections on Netflix.. The Rector and /or the Corporation, appoint members of the parish to serve as Treasurer, Envelope Secretary, Deputy Rector’s Warden, Sexton/Verger and other positions as required. The Parish Council is made up of: members of the Corporation, members appointed by the Corporation, and members elected at Vestry, including deputy People’s Warden. Several of the council members are Chairpersons of committees that are responsible for the ministries within the parish.